By the blessings of Khonshu, the Moon Knight walks again! The white knight of the Marvel Universe returns in this 12-inch tall Marvel Premier Collection statue! 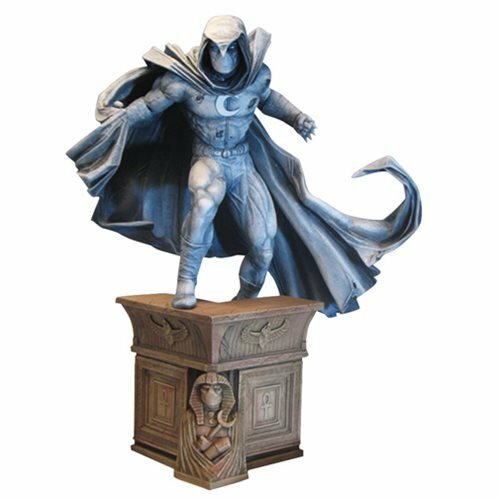 The Marvel Premier Collection Moon Knight Statue depicts the Fist of Khonshu slightly battle-damaged and perched on a rooftop with Egyptian architectural details. This resin statue is a limited edition of only 3,000 pieces, and comes packaged with a certificate of authenticity in a full-color window box. Sculpted by Jean St. Jean. Ages 13 and up.